A group of history minded people from all over Albert County met in Alma to form a group called the Albert County Historical Society. The Albert County Historical Society was incorporated as a Non-profit organization in New Brunswick in 1957. The Society held regular meetings to decide how to best preserve the history of the county. They decided to establish a museum and chose a building in Hillsborough to look at. A short time later an opportunity arose in the shiretown of Hopewell Cape. The County Council had recently built a new Municipal Office building so the former offices were now surplus. It so happened that the President of the Historical Society, Judson Cleveland, was also a member of the County Council. Arrangements were made for the Historical Society to lease the former Records Office for use as a museum. The Historical Society began collecting artefacts in 1960 to be on display in the museum. After some modifications were made to the Records Office, including removal of the stone wall between the two sections of the vault, the Albert County Museum was opened to the public in 1962. Later that year, after an act of council to exhume the body of Thomas F. Collins was completed, the Albert County Gaol was sold to the Society for use as a permanent museum. Modifications were made to open up the Gaolkeeper’s apartment rooms for use as galleries as well as upgrades to the electrical service. When the museum opened for the season in 1965, it was in the Gaol. All County Councils were dissolved in December 1966 and all assets became the property of the province of New Brunswick. In 1972 the Albert County Court House was sold to the Historical Society and opened to the public as part of the museum in 1975. 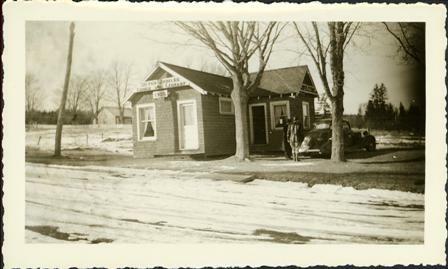 The County Records Office, Tax Office and the Carriage Shed associated with them was also sold to the Historical Society in 1972 in the same transaction as the Court House, but these other buildings were only used as storage. The Historical Society saw the growing need for space to properly display and interpret the industrial aspects of the county so they obtained funding over the first few years of the 1980’s to build the Exhibition Hall. It was built in three stages with the last piece completed in 1983. In 2003, the boards of directors for the Hopewell Cape Community Hall and the Silver Jubilee Lodge & Library both decided to merge with the Historical Society in the hope of being able to preserve the buildings. After several years of effort the Historical Society was finally able to secure funding for an entire site redevelopment in 2007. Over the next 3 years the $1.4 Million project saw all of the buildings refurbished. In 2010 the revitalized Albert County Museum was officially opened. It now consists of eight buildings featuring 22 themed galleries that tell the stories of “The People of the Tides” – the human and industrial history of Albert County.